Got green thumb? Get creative with this design on gardening aprons, t-shirts and more for your gardening enthusiasts. 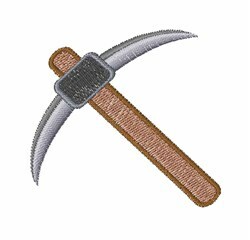 Easy Embroidery is happy to present Pick Axe machine embroidery design which has 2628 stitches and is [48.75 mm x 48.92 mm] large. If you would like to view more embroidery patterns please search on our embroidery designs page.